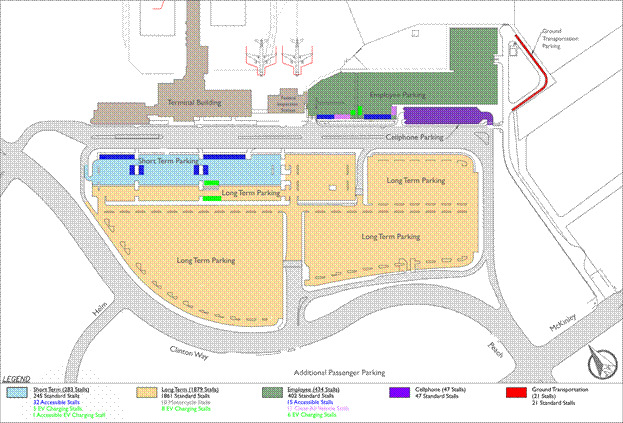 The airport offers two types of parking lots on its territory: Short-Term and Long-Term Parking . Moreover, the Cell Phone waiting area is available free of charge for those picking up or dropping off the passengers. However, the waiting time shall not exceed 60 minutes, and the driver shall be in the vehicle for that whole time. The maximum daily rate for the Short-Term Parking is $12.00, and it is $1.00 for every 20 minutes of the 1st day. However, for disabled passengers, the Short-Term Parking is free of charge for the first 2 hours and $8.00 for every additional hour. The maximum daily rate for the Long-Term Parking is $8.00, and it is $1.00 for every 20 minutes of the 1st day. However, for disabled passengers, the Short-Term Parking is free of charge for the first 2 hours and $8.00 for every additional hour. The fee for the lost parking ticket is $12.00.